STEM Learning Robotics CPD: Go Backstage at Robot Wars Series 3! 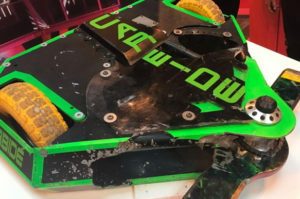 Would you like a VIP backstage pass to Robot Wars series 3? Take part in STEM Learning‘s latest Robotics CPD – we’ll be there, come join us! 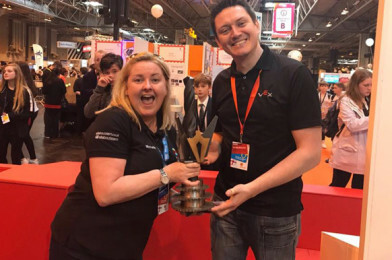 Yes, that’s All About STEM‘s Managing Director getting her hands on the Robot Wars Trophy! If you are interested in helping to develop robotics in your Science, D&T, Maths or Computing lessons, here’s your opportunity to use Robot Wars as inspiration! It’s a 2 day commitment. 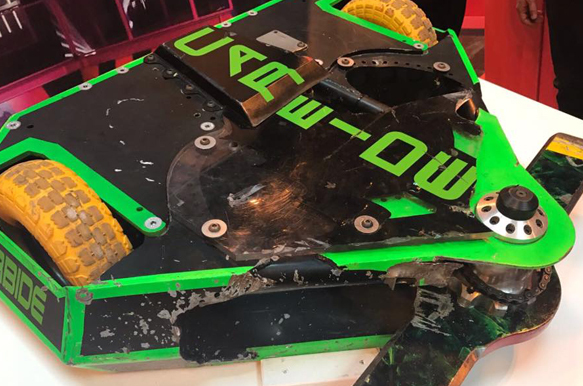 Day 1 is a VIP experience at Robot Wars in Glasgow – meet the teams, tour the arena and watch some battles. Day 2 is at the National STEM Learning Centre in York, sharing the ideas that you have has since the Robot Wars day to get more robotics into lessons. The fee is £250 for both days, state funded schools / academies / colleges get a bursary of £600 to help with the cost of travel, developing resources and cover for Day 2. You also get to borrow a VEX Robotics kit to try out some of your ideas! 12 teachers took part last year, this year there is space for 15. It’s first come, first serve, so act fast!